There have been many films in Bollywood which have been based on the India-Pakistan war. However, very rarely has Bollywood dealt with the subject involving the Indian Navy and even furthermore, about the underwater submarine war between the two nations. This week’s (bilingual) release THE GHAZI ATTACK is based on this unique unknown real life event. Will the film ‘sail’ its way to success at the Box-Office or will it sink without a trace, let’s analyze. THE GHAZI ATTACK’s story (Sankalp Reddy) is based on the mysterious sinking of ‘PNS Ghazi’ during the Indo-Pakistani War of 1971. The film starts off with a tremendously engaging baritone voiceover of Amitabh Bachchan, who gives an insight into the story set up. After the Indian Navy decodes a cryptic message by the Pakistan Navy about a surprise attack on India, the Indian Navy officers become extremely alert about the situation. In order to combat the attack, they recruit a team of three officers to lead India’s submarine S21. The trio, then go on a classified mission to do a detailed underwater recce of the situation. The three principal officers chosen for the mission include Lt.Commander Arjun Varma (Rana Daggubati), Captain Ranvijay Singh (Kay Kay Menon) and Executive Officer Devraj (Atul Kulkarni). While Lt.Commander Arjun Varma happens to be the ever-duty-abiding officer, Captain Ranvijay Singh, besides being the senior most and experienced of the trio, also happens to be a man who likes to follow his instincts and not like to wait for the orders. On the other hand, the Executive Officer Devraj is someone who knows whose order to follow and at what time. Even though the officers aboard the S21 are merely sent for recce, little do they know that they will engage with Pakistan’s most decorated submarine ‘PNS Ghazi’, which is ventured into Indian waters in order to destroy India’s prestigious ‘INS Vikrant’. 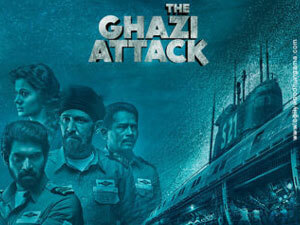 ‘PNS Ghazi’ launches an attack on an Indian merchant ship on the east coast to distract the crew on ‘S21’. While Captain Ranvijay Singh orders a direct and uninformed attack on ‘PNS Ghazi’ right away, it is the dutifulness of Lt.Commander Arjun Varma that prevents him from doing so. Thus begin fights and ego clashes between the two officers. What follows after that, are a series attacks and war games between both the submarines under the ocean. Do the Indian officers aboard ‘S21’ manage to survive the Ghazi attack and defeat the Pakistan submarine or do they succumb before the enemies, is what forms the rest of the film. THE GHAZI ATTACK’s promos gave a fair idea about the film’s plot. The film’s taut screenplay (Sankalp Reddy, Gangaraju Gunnam, Niranjan Reddy) and its well-researched script is extremely engaging and keeps the viewer hooked to the seats till the end of the film. Given the fact that the film’s premise was set majorly inside a submarine, one has to applaud the film’s writing and execution, which undoubtedly comes across as one of the toughest aspects of the film. Also, the kind of homework done in order to unearth the story is extremely commendable and remarkable. The film’s dialogues (Azad Alam) are decent. Despite THE GHAZI ATTACK being Sankalp Reddy’s debut film as a director, he shows immense promise and potential as a filmmaker. The way in which he has shot the film is extremely intriguing and engaging. He has, in true sense of the word, created an edge of the seat thriller war movie in the form of THE GHAZI ATTACK. The film’s first half not only establishes the film’s central characters, but also sets the technical know-how of how the Navy operates. It is however the film’s second half from where the story takes off. Brownie points to Sankalp for keeping the film’s narrative simple and to the point. As a filmmaker, Sankalp has ensured that there is never a dull moment in the film. Certain moments in the film when Pakistani Navy attacks the Indian submarine or when the Rana gives an inspirational speech to his crew are hair-raising and show the true talent of the director. There are also certain instances where the director could’ve made the moments more dramatic. Also, he misses out explaining certain crucial twists in the story like when Rana goes to rescue Tapsee and the time is running out, Tapsee’s relation with the small girl and the communication system breaking on S21. However, overall, he does a fine job of narrating a challenging story. 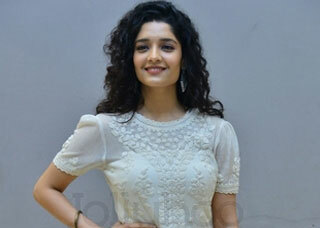 When we speak of performances, it’s a bit tough and would also be unfair to single out one person in the film, as the film is a joint effort of many talents. The film, in totality, belongs to the impeccable trio of Rana Daggubati, Kay Kay Menon and Atul Kulkarni, who own the film right from the word go. After having done the smash hit BAHUBALI: THE BEGINNING, Rana Daggubati is definitely growing from strength to strength in Bollywood. Given his real life physical stature, he is extremely convincing in the role of Lt. Commander Arjun Varma, who, after starting off as an Lt.Commander, takes charge of the entire submarine when the need and situation arises. The scenes where he feels helpless whenever he gets overshadowed by Kay Kay Menon are outstanding. On the other hand, there’s Kay Kay Menon, who shines superlatively in the role of ‘I-set-my-own-rules’ Capt. Ranvijay Singh. The emotional aspect of Kay Kay Menon too has been captured very sensitively. Besides them, there’s Atul Kulkarni, who was last seen in the Shah Rukh Khan starrer RAEES. THE GHAZI ATTACK sees him rise phenomenally as a performer and qualifies to be of one of his career’s best films in Bollywood. Both, Taapsee Pannu and the late Om Puri are in cameos. Rahul Singh in the role of Pakistani Naval officer and the ruthless Captain of ‘PNS Ghazi’ is also brilliant in his part. 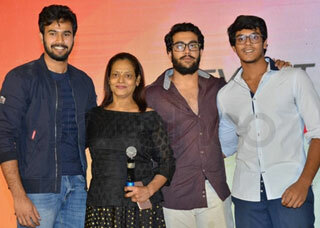 Besides them, all the character actors are also well cast make their presence felt in the film. While the film has absolutely no scope for music (Krishna Kumar aka K), it’s the film’s background music, which is outstanding and helps the narrative in a big way. The film’s cinematography (Madhie) is quite good. 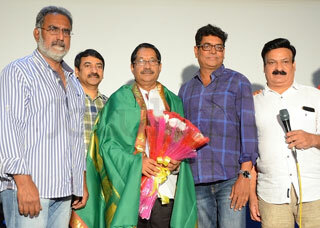 On the other hand, the film’s editing (A. Sreekar Prasad) is tight and highly commendable. The VFX used in the film though could have been better. On the whole, THE GHAZI ATTACK is a gripping war drama that leaves a stunning impact. At the Box-Office, the positive word of mouth will help the film in a big way. Definitely, a must watch.